There are lots of different ways you can travel to the event, we would recommend using public transport where possible, please plan your journey to the event in advance to ensure you don’t miss any elements of the show you wish to see and check any changes or restrictions that will be in place to deliver the show..
For the latest travel updates on the day, confirm your attendance on the Official Liverpool’s Dream Facebook Event and follow us on Twitter. We will try to our best to maintain access and re-open roads as quickly as possible however, this will be dependent upon the number of people viewing the event as safety will always be our priority. There will be significant road closures – details of which can be found on our road closures page. Please note that these are only approximate and may be subject to change during the event. There is no guarantee that the roads will re-open exactly at the times specified. The full list of road closures can be found on the road closures page. How long will roads be closed for? We will try our best to maintain access and re-open roads as quickly as possible. However, this will be dependent upon the numbers of people viewing the event as safety will always be our priority. Whilst the giants rest during the day, roads will remain closed for considerably longer. Will there be a signed diversion? With the major closures there will be signed diversions on both sides of the water. There will be no signed diversions when roads are closed as the ‘Giants’ move along the route. Will there be access for the emergency blue light service? There will be emergency access for all blue light services along all routes at all times. What do I do if I need access for visitors or deliveries? Unfortunately if it is not an emergency, access will not be permitted whilst the event is in in your area. There may be some disruption or restriction to your usual means of access and egress to your premises. We will try our best to maintain access and re-open roads as quickly as possible. Plan early to arrange for deliveries on another day and ensure that visitors arrive in time before road closures go in. Businesses and residents directly affected by the road closures will be contacted by letter prior to the event. If you have a specific query please email giantspectacular@liverpool.gov.uk. Liverpool is a well connected network, thanks to Merseytravel, with regular bus services running throughout the day. There are many routes around the city which can take you to the heart of the celebrations. Liverpool ONE Bus Station (Please be aware, this will be closed from 3.00pm – 8.00pm Friday 5 October, closed all day Saturday 6 October until the later evening period and will be open on Sunday all day but access will be restricted due to road closures). Queen Square Bus Station (Please be aware, this will be closed up until 12 noon on Friday 5 October and up until 1.00pm on Saturday 6 October). All buses are fully accessible and there are a wide range of tickets available to suit all budgets. Please be advised that due to road closures along the route, some services may be diverted or delayed. We recommend you leave plenty of time to travel by bus on both sides of the river Mersey to avoid disappointment. Please visit Merseytravel.gov.uk for all the information you need, including where to catch your bus and the times. For specific enquiries regarding bus company operators, please visit the Arriva or Stagecoach websites. If you are visiting the Giant Spectacular event in Liverpool please be aware there will be a number of local Merseyrail station closures to deliver the transport services. Please check your best route by planning your journey in advance, please visit your rail provider website, or check Twitter for the latest updates. There are a number of additional train services which run in and out of the city including TransPennine Express, East Midlands Trains, London Northwestern and Virgin Trains. Please note: RMT strike action on Saturday 6th October will impact Northern services – all customers should check the Northern website before travelling. Timetables should be available from Tuesday 2 October. Liverpool John Lennon Airport is around a 20-25 minute taxi journey to Liverpool City Centre and offers a wide range of international connections if you are flying into Liverpool. When you arrive in Liverpool there is also a regular Arriva Bus service to and from the airport including the 86A and 80A which departs from Liverpool bus station every 20 minutes. Please be advised that this service may be diverted due to road closures so please allow plenty of additional time. More information on transport via Liverpool John Lennon Airport can be found here. There are plenty of dedicated cycle lanes and cycle parking in and around the city centre. The Liverpool Cycle Map is a helpful guide and is available for you to view here. Liverpool also benefits from a Citybike Cycle Scheme, where you can hire a bike during your visit. For a small charge of £3 per day, what better way to explore the city! Click here to find out more. There are a number of taxi services in Liverpool and Wirral which you can use to attend the Giant Spectacular event including our popular Black Cabs. Please be aware that due to road closures, you may have to be dropped off further away from your destination. Services may also be busy so please leave plenty of time for your journey. For the weekend of the show, the National Express coach station will be operating from Norton Street, off London Road and not the Liverpool ONE bus station. Regular coach services operate in and out of the city, you can relax on the journey and arrive refreshed. For more information please visit the National Express website for coach times. Coach companies are advised that coach drop off/ pick up locations will be George’s Dock Way / Mann Island on Friday 5 October. Please note, the waterfront will be closed from James Street to Parliament Street and for all traffic from 5.00pm – 8.00pm. Coach companies are able to drop off / pick up from Hope Street on Saturday 6 and Sunday 7 October. There are a number of parking facilities available in both Liverpool and Wirral which include accessible parking and some include access to electronic charging stations. Car park access and egress will be affected whilst road closures are in operation. Please check with individual car parks on arrival regarding the operational times of their car park on the day. 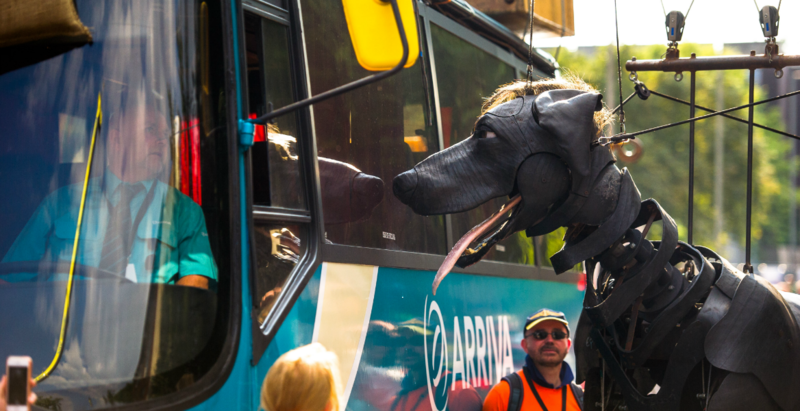 We strongly advise that you use public transport to attend the Giant Spectacular event for this reason. Despite the road closures there are still a large number of City Council parking facilities across Liverpool which will be available during the event. All car parks and on-street parking (that will be available, not including closed and parking due to the event) can be paid for using your mobile phone. Motorcycle parking is available free of charge in designated motorcycle parking bays in city centre locations, providing they have not been closed due to the event. Blue badge holders can park in any on street parking bays and most car parks free of charge – providing the spaces are available due to the event. More information on City Council parking, including Blue Badge parking and a search tool for your chosen car park can can be found on the Liverpool.gov.uk website. There are six Q-Park facilities in Liverpool with city centre offering accessible parking parking and electronic charging points. Season tickets and discounts for extended stays are available. The Q-Park Rewards App also offers free parking on every 6th visit. Please visit the Q-Park website for details on prices and a map of the parking facilities in the city. Please be aware – there will be NO ACCESS to the Liverpool ONE Q Park on The Strand throughout Saturday 6th October from 8.00am – 6.00pm and Sunday 7th October from 6.00am – 7.00pm but all other car parks will be open (with minimum restrictions) throughout the event. NCP run a number of car parks in the city with Liverpool Pall Mall and Liverpool Moorfields best placed to offer suitable parking (subject to road closures affecting access on Saturday afternoon). More details can be found at the NCP Pall Mall page and the NCP Moorfields page. if you do choose to travel to Wirral by car then please access New Brighton via the motorway and Harrison drive as there will be limited accessible parking for blue badge holders in the Dips area. This will be filled on a first-come first-served basis and once this area is full, blue badge holders will be directed to park on the Dips. If you want to take a unique journey to Liverpool’s Dream, why not ferry ‘cross the Mersey between both elements of the show on a Mersey Ferry. The Mersey Ferries will be running as normal on Thursday 4th and Friday 5th Oct.
On Saturday 6th and Sunday 7th, River Cruise Explorer services will be suspended to allow for two shuttle services to run about every 20 minutes – one between Woodside and the Pier Head (09:30 to 18:40) and one between Seacombe and the Pier Head (09:20 to 18:50). Commuter ticket prices will apply. Visit the Merseyferries website for more information or follow the @merseyferries Twitter. River Cruise Explorer services will be suspended during the weekend.